The new species was discovered during research into the 29 specimens of pig-footed bandicoot held in museums across the world. Scientists had thought all the specimens were of the same species, Chaeropus ecaudatus. By using a combination of traditional morphology, morphometrics, palaeontology and molecular phylogenetics, they discovered there were in fact two different species. DNA from specimens collected by Sir Thomas Mitchell in 1946 confirmed the existence of two species not only morphologically, but genetically. Roberto Portela Miguez, senior curator in charge of mammals at the Museum, said, "This study demonstrates the importance of museum collections. Using a combination of historical research, new techniques and museum specimens from around the world has allowed us to identify and learn more about this recently extinct species. Collections like that of the Natural History Museum are fundamental to increase our understanding of present and past biodiversity on Earth. While knowledge of this new species arrived too late to save it from extinction, hopefully the lesson learnt demonstrates the urgency and importance of supporting biodiversity research." Researchers also used fossil records and Aboriginal oral accounts recorded in the 1980s to trace the two species' distribution. Chaeropus yirratji was thought to have lived in sandy environments in central Australia and Chaeropus ecaudatus lived in the southern peripheral areas of the arid zone of Australia. Both species were thought to inhabit areas of Western Australia. Dr. Kenny Travouillon, Curator of Mammalogy at the WA Museum, believes the discovery of Chaeropus yirratji is a breakthrough for science as little was known about the mammal previously. "pig-footed bandicoots were extinct by the 1950s, therefore there was very little chance for scientists to study the species. More so, there are only 29 specimens of Pigfooted Bandicoots in existence." 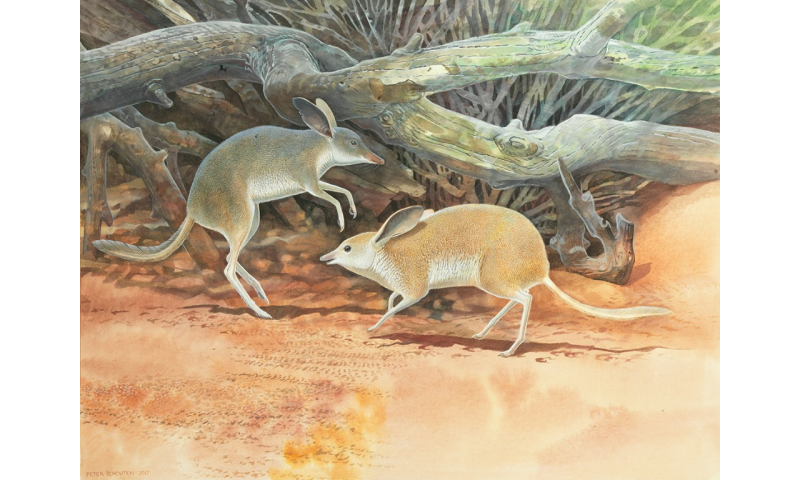 The first species of pig-footed bandicoot described, Chaeropus ecaudatus, is an aridadapted bandicoot which evolved along with bilbies and other bandicoots more than 20 million years ago. The species was named in 1838 based on a specimen found without a tail from the Murray River in New South Wales. The paper "Hidden in Plain Sight: Reassessment of the pig-footed bandicoot, Chaeropus ecaudatus (Peramelemorphia, Chaeropodidae)," was published in Zootaxa.